Pax East is fast approaching and after a three year absence, ASUS ROG is returning to the show floor and we can’t wait to see you there! 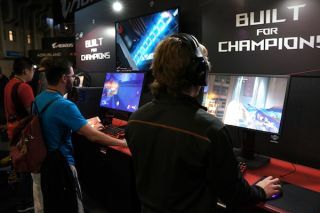 The Republic of Gamers is heading to Boston, Massachusetts to showcase the latest gaming hardware. Join us and test the performance of ROG’s extensive line of desktops, laptops, monitors and peripherals, highlights include the STRIX GL12 Gaming Desktop and a never before seen laptop. There is plenty of activity in-store to keep you entertained, including 3 vs 3 Overwatch matches, play to receive the new Horsem4n figurine, VR demos featuring Superhot, daily peripheral giveaways and quality game play experiences. Look out for the Drop Crate to enter a new laptop giveaway. Don’t miss your chance to meet Lirik who’ll be joining us in the booth on Thursday, 5 April. Come down to the main floor and visit us at booth 16001 to play games, experience some great PC hardware, takeaway swag and have some fun. While there, sign up for the ROG Elite Rewards Program to start earning points. If you’re already a member, stop by to redeem your bonus points. See you at Pax East, 5-8 April, 2018.